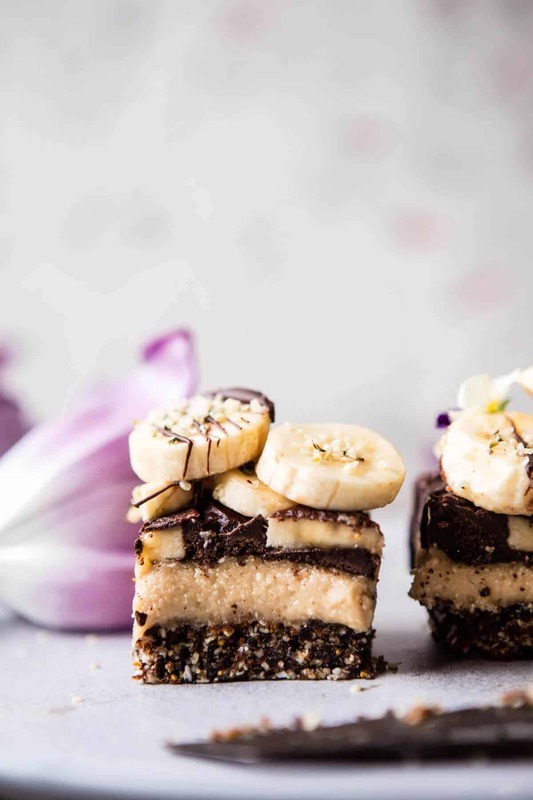 Say hello the healthiest, yet most indulgent dessert bar. You guys may have noticed, but lately I am super into turning my chocolate treats healthy…or maybe more healthy…ish. I’ve always been pretty aware of the food my family and I eat, making easy, healthier swaps whenever possible, but this last year I’ve made a bit more of a push to healthify the foods I’m making, especially when it comes to dessert. Don’t get me wrong, I will never be one to not make a serious chocolate birthday cake (with the BEST whipped chocolate buttercream) or good old-fashioned chocolate chip cookies, but for every-day-chocolate treats, I’m aiming for them to be just a bit healthier. I am totally one of those people who full on believes in the “food is medicine” thing, and with some recent family sickness and even cancer scares, it’s just something I’ve been a little more aware of. DON’t worry, the over the top chocolate treats are not going away, but you know, balance is always a good thing! Sooo, these bars, even though they’re packed full of all healthy things, you’d truly never know it. Like never. I mean, do you see that raw chocolate layer?! 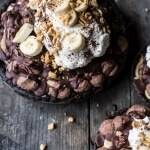 If there is one combo I truly love, it’s banana and chocolate. 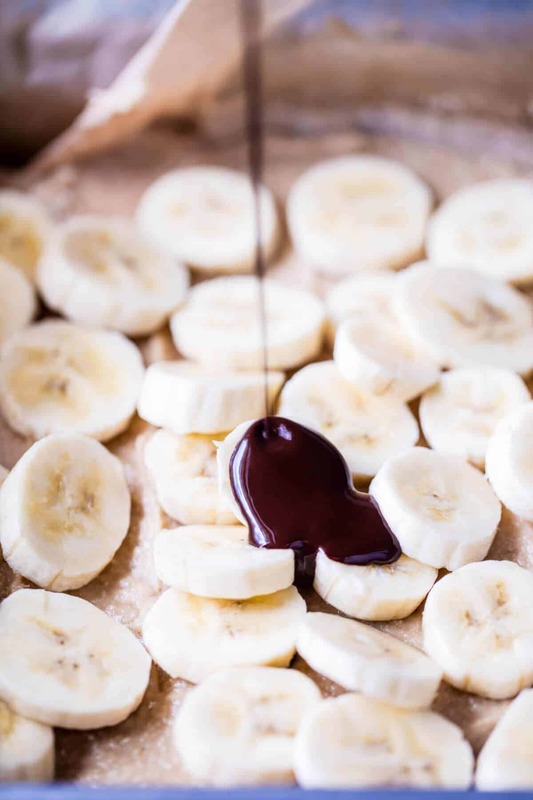 When I was a kid, my mom taught me this little trick of sticking chocolate chips on a banana for a quick and easy chocolate treat. I LOVED it. 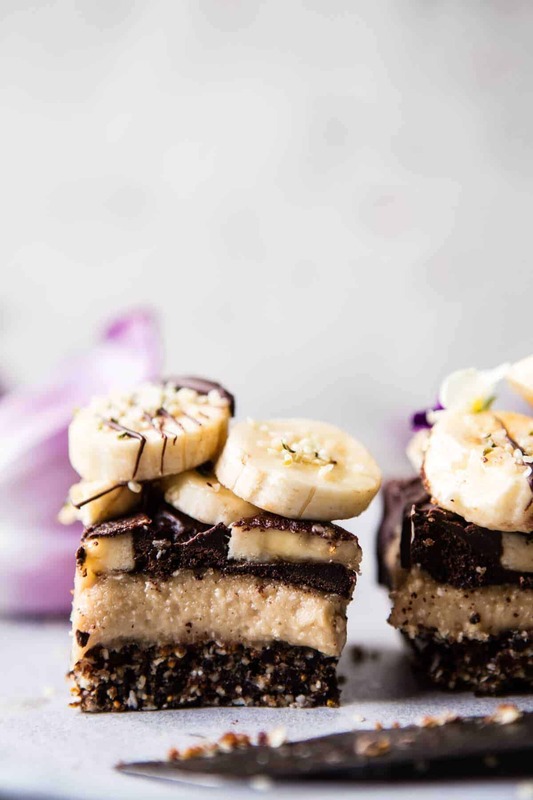 Now a days I do a banana and chopped dark chocolate <–not going to lie, it’s the best snack when you need a quick little chocolate fix. 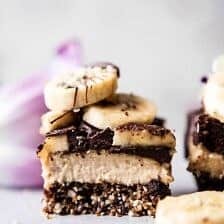 That little snack, plus banana bread, are two of the reasons why I love the banana chocolate combo so much, and these banana cream pie bars are just adding to my obsession. 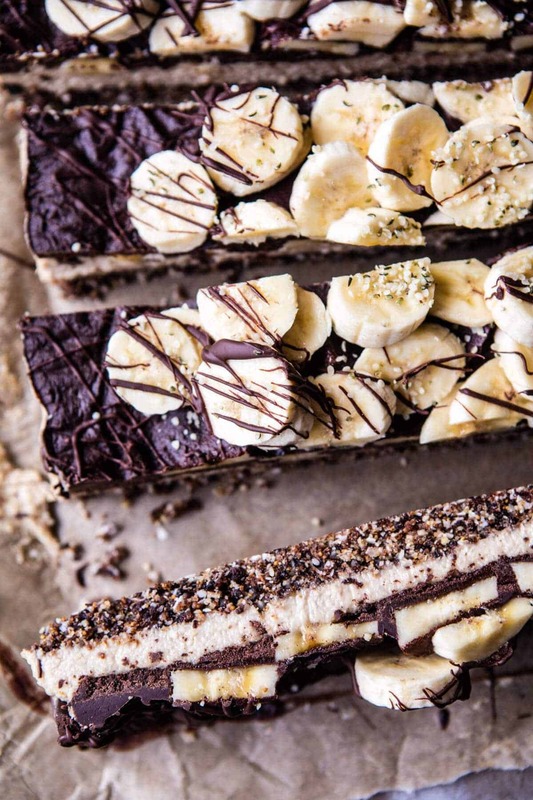 If you are a lover of banana cream pie, these bars are totally for you. Honestly, I think they are better than the original, but that might just be because I love cashews and coconut, and these bars have BOTH. OKOK, so here’s how these go. The base is a mix of buttery pecans, sweet dates, coconut, and vanilla. Add the ingredients to a food processor until they’re finely ground and then firmly press into the bottom of a pan. 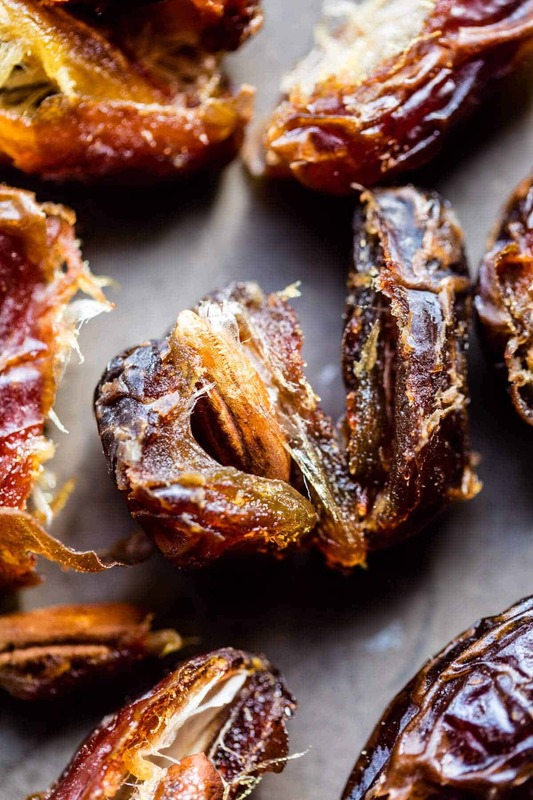 The base is simple and might not seem special, but the combo of pecans and dates is really delicious. Think extra buttery and sweet, but without any actual butter or added sugar…oh, and chewy too, super chewy! The filling is my favorite part. I used roasted cashews, coconut and a touch of vanilla to create a cashew cream that very closely resembles the pudding in banana cream pie, only I think better…but again, I love cashews and coconut…love, love, love. I like to use roasted cashews not only for the added flavor, but also because they blend quickly into a creamy mix. 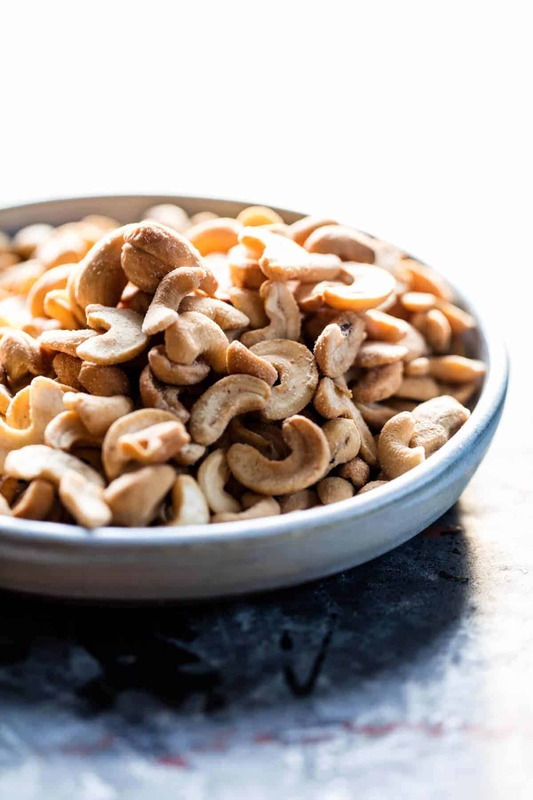 If you want to use raw cashews, I recommend soaking them overnight in water, draining and adding a pinch of salt to the mix. For my chocolate layer, I really wanted to go the completely RAW route. Cacao is a major superfood for many reasons (google cacao if you are curious), and my family has really grown to love it over the last year. Making raw chocolate is super easy, you just need cacao or cocoa powder, coconut oil, and a touch of honey for sweetness. Simple as that. If you are new to cacao powder, be warned it’s bitter and needs the honey for sweetness. I recommend using half cacao and half cocoa if you are nervous about it! You could also just melt some dark chocolate and easily go that route as well! Top with tons and tons of bananas and DONE. 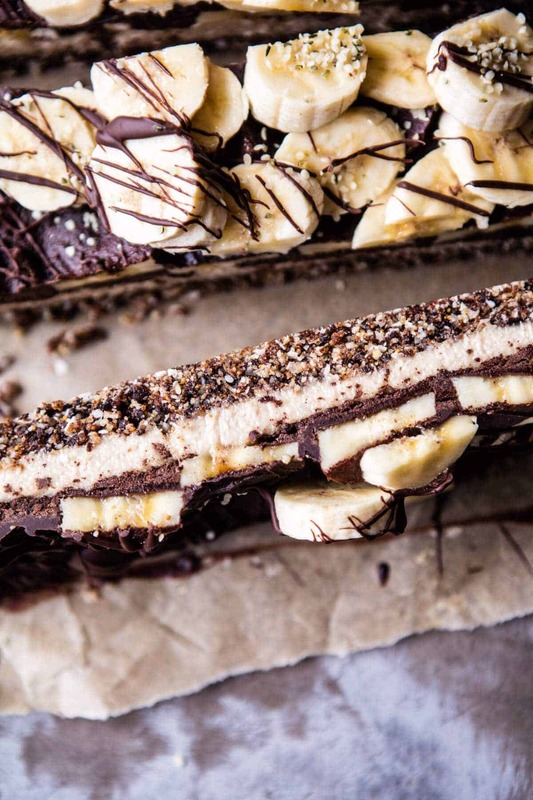 Surprisingly, these bars are SO easy to make and require no oven time. Got to love that! I really can’t express enough how much I am obsessed with these bars. I hope you guys try them and love them so we can soon share this obsession!! Hoping that everyone’s weekend plans include these bars. I will be making them, eating them, and telling NO ONE…sharing is just too hard! <—just kidding! 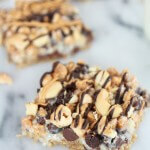 These no bake bars have all your favorite flavors in them! 1. Line an 8x8 inch square baking pan with parchment paper. 2. In the bowl of a food processor, combine the pecans, 1 cup coconut, dates, 1 teaspoon vanilla, and pinch of salt. Pulse until finely chopped and easily holds together when squeezed in your hand. Press the base mixture into the prepared pan. Place the pan in the freezer. 3. Going back to the bowl of your food processor (no need to clean it! ), combine the cashews, remaining 1 cup coconut, 1/2 cup water, and remaining 1 teaspoon vanilla. Pulse until smooth and creamy. Remove the base layer from the freezer and add the cashew cream in an even layer. Top with sliced bananas. 4. 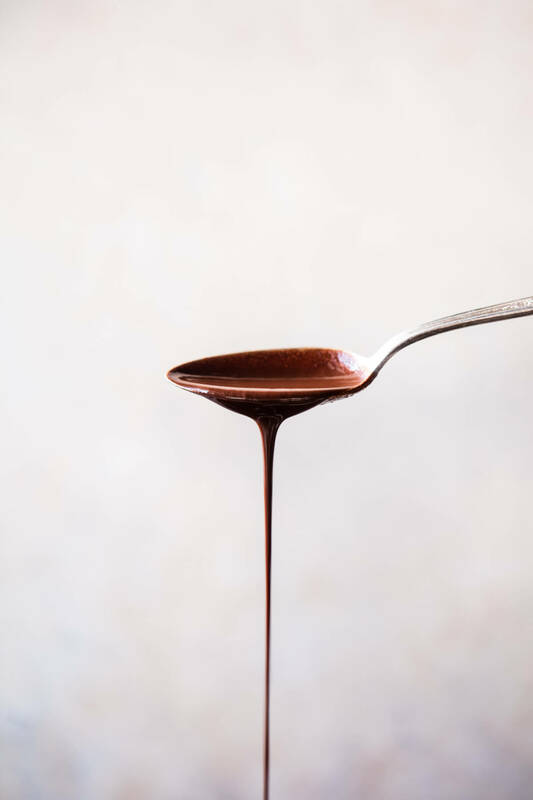 In a separate bowl, whisk together the melted coconut oil, cocoa and honey. Pour the chocolate mixture over the bananas. Place in the fridge and chill until firm, at least 1 hour. 5. 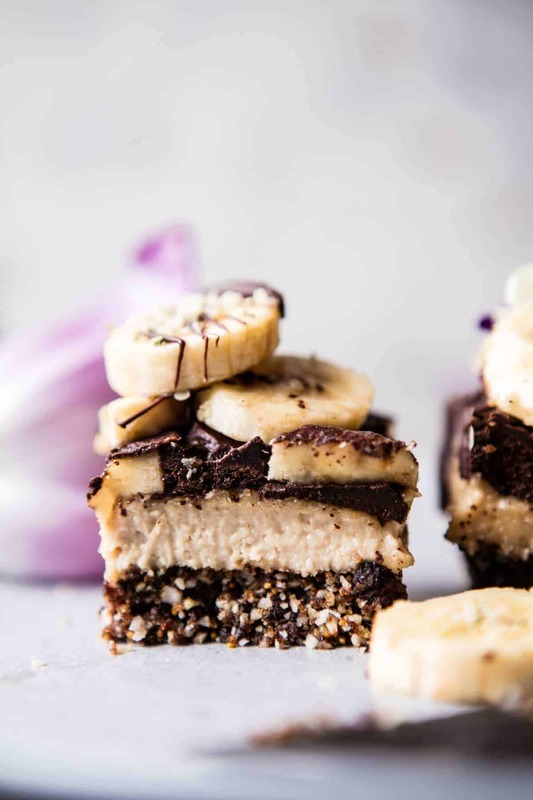 Cut into bars and serve topped with fresh bananas and seeds. Keep bars stored in the fridge. Four layers of perfection…you are welcome. Happy chocolate banana cream filled FRIDAY! 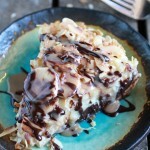 Banana Cream Pie…with Chocolate and Peanuts! 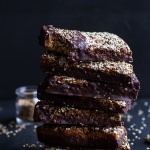 Dark Chocolate Dipped Crunchy Coconut Cashew Sesame Bars. WOW!!! This also is GF,DF!! I have someone in the family that would love this I am sure. I hope they do love it! Thanks Charlotte! I hope you love it Caroline! Thank you! These look amazing! I can’t help but make swaps to make my sweet treats healthier too, and these tick all the boxes. Yum! Thank you Sahra! I hope you love it! This looks amazing! We always have healthy bars in the fridge for snacking. Can’t wait to try it. One question – how long do they last and do the bananas turn black quickly? Well I hope you love this one, Annie! Thank you! Awh thank you so much Chelsea, this is so sweet! Oh my goodness! These look so good. And your photography…can we just talk about that for a sec’? That shot with the chocolate drizzling from a spoon, followed with a photo of the chocolate drizzling onto the bananas…brilliant! I’ve been a follower of your blog for a few years now, and love seeing the creative combinations of flavors in your recipes. This is no exception. I am thrilled you like my blog & I hope you continue to! Thank you so much Sarisa, have a great weekend! These sound delicious! I have a clarifying question – for the coconuts… Do you mean coconut shreds? Or coconut milk? Hey Polly! I mean coconut shreds. Let me know if you have questions. Hope you love these! Yes!! Glad you are enjoying these, Laura! Thank you! Right?! SO GOOD! Thanks so much Laura! Thanks so much, Mary! I actually don’t like to count calories or fat. I believe in eating foods that are full of nutrients and don’t base healthiness off of the amounts of fat a food or recipe contain. Nuts and seeds, which are some of the healthiest foods out these are just really high in fat…but the good kind! 🙂 Thank you so much for the kind words. I am thrilled you enjoy my recipes! I know you looove coconut, but I don’t like it as much 🙁 is there a way it could be substituted with something else? Hmmm, I think using an equal amount of another nut like almonds would work. Maybe even sesame seeds. Do either of those work? Let me know if you have questions! Thanks! I made these last night and my husband and I LOVED THEM! Thanks for a great recipe! And I love the healthy fats! Thank you Lydia! I am so glad you and your husband loved these!! These are amazing! I’ve made them twice and I can’t believe how delicious they are for how few ingredients and little effort goes into them. I cut them into about 25 bars because they’re so decadent. Definitely a go to recipe, thanks! Wooooh I wan’t to test that so badly, it looks insane(ly good) !!!! I hope you get to try it! Thanks so much!